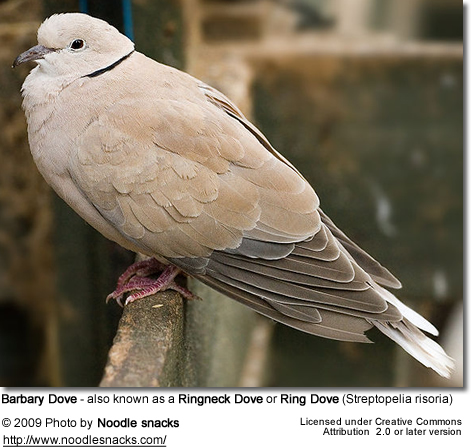 The Ringneck Dove, Ring Dove, or Barbary Dove, Streptopelia risoria, is a small domestic dove. The Half-collared Dove is also often referred to as Ringneck Dove. 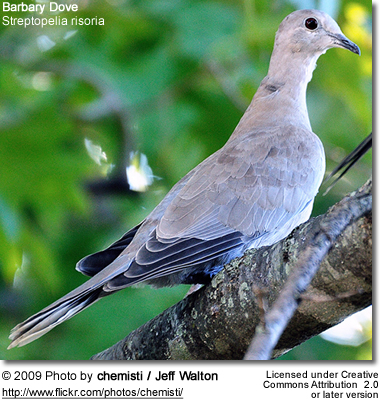 Although the Ringneck Dove is normally assigned its own systematic name, as Streptopelia risoria, considerable doubt exists as to its appropriate classification. Some sources confidently assert that it is a domestic form of the Eurasian Collared Dove, S. decaocto, but the majority of evidence points to it being a domesticated form of the African Collared Dove, S. roseogrisea. It appears that it can hybridise freely with either species, and its status as a species must therefore be regarded as doubtful. However, because of the wide use of both the common and systematic names, it is best to consider it separately from either of the putative parent species. Adult Ringneck Doves typically weigh between 4.9 - 7.6 oz (140 - 215 grams). The average weight of an adult female is 5.6 oz (160 grams) and for an adult male about 6.35 oz (180 grams). Ringneck Doves have been domesticated for 2000 to 3000 years. They are easily kept, and long-lived, in captivity, living for up to 12 years, and are noted for their gentle nature. In recent years they have been used extensively in biological research, particularly into the hormonal bases of reproductive behaviour, because their sequences of courtship, mating and parental behaviour have been accurately described and are highly consistent in form. Dove fanciers have bred them in a great variety of colours; the number of colours available has increased dramatically in the latter half of the twentieth century, and it is thought that this has been achieved by interbreeding with S. roseogrisea. 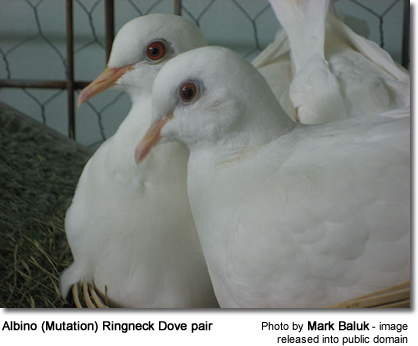 Some of these doves carry a mutation that makes them completely white. These white ringnecks are most commonly used in stage magic acts. White Ringtail doves are traditionally released in large public ceremonies, since it is a peace symbol in several cultures, and "dove releases" are also sometimes found at weddings and funerals. 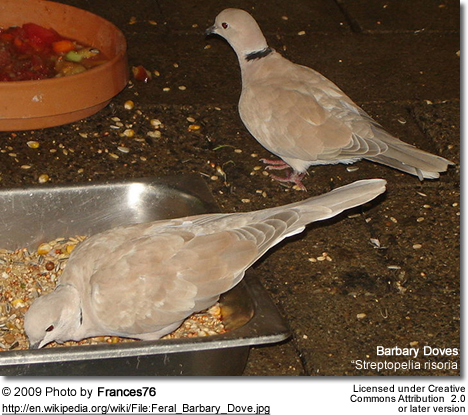 However, it should be noted that a release dove is, in fact, usually a homing pigeon, as Barbary Doves lack the homing instinct and generally do not survive in the wild, making them a poor choice for a release bird. Feral populations of Ringneck Doves establish themselves readily as a result of escapes from captivity, but they will merge with local populations of Collared Doves if they exist. There is a small feral population in Los Angeles, California, where neither S. decaocto nor S. roseogrisea is currently found. Avianweb visitors from Texas (Houston) and Colorado report that ring-necked doves are frequent visitors at their bird feeders. However, it has been observed or theorized that individual doves are unlikely to fare well. Ringneck Doves released to the wild cannot readily survive, as they are not equipped to live wild in most climates, have no natural fear of predators, and have never learned to distinguish "natural" foods. 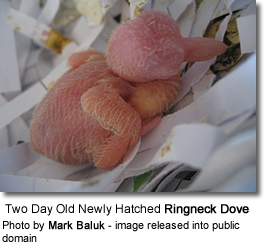 The coo of the ringneck dove is created by muscles that vibrate air sent up from the dove's lungs. These muscles belong to the fastest known class of vertebrate muscles, contracting as much as ten times faster than muscles vertebrates use for running. This class of muscles is usually found in high speed tissue such as a rattlesnake's tail. Ringneck doves are the first bird species to have been found to have this class of muscle. Adapted and Added from Wikipedia. This article is licensed under the GNU Free Documentation License. It uses material from the Wikipedia.org ... Additional information and photos added by Avianweb.